A bridge is a dental appliance that replaces one or more natural missing teeth, thereby ?bridging? the space between two teeth. Fixed bridges are cemented into place next to the ?abutment? teeth ? surrounding teeth on either side of the space. 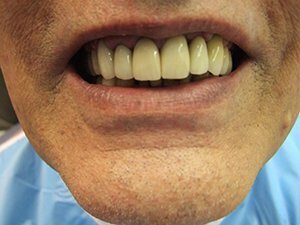 Unlike removable partial dentures, fixed bridges cannot be taken out of the mouth by the patient. A fixed bridge is a device that usually consists of three units a pontic (the false tooth) fused between two crowns that are cemented onto the abutments teeth. Bridges are made of metal and porcelain or sometime just porcelain. If you are missing any teeth and committed to maintaining good oral hygiene, you may be a good candidate for a bridge. A bridge is the most natural choice to fill the space in your mouth left my missing teeth. 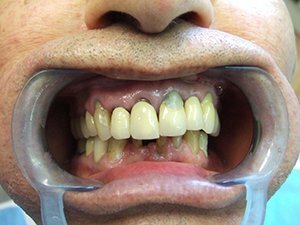 If left unfilled, this space can cause the surrounding teeth to drift out of position and can cause teeth and gums to become more susceptible to tooth decay and gum disease that can cause further tooth loss. Fixed bridges not only correct an altered bite, improve your chewing ability and speech, but they also safeguard your appearance by preventing the collapse of your facial features that can cause premature wrinkles and age lines. Besides the most common type of bridge, another popular design is the ?Maryland? bridge, primarily used for the front teeth. This us usually the most economical choice when the abutment teeth are healthy and don?t contain any restorations. The pontic is fused to metal bands that can be bonded to the abutment teeth with a resin cement and hidden from view, reducing the amount of preparation on the adjacent teeth. A cantilever bridge may be used if there are teeth on only one side of the span. This involves anchoring the pontic to one side over one or more natural, adjacent teeth. If there are no adjacent teeth to act as anchors, your dentist may recommend an implant a metal post that is surgically imbedded into the bone and capped with a crown as an abutment. The dentist uses a soft, mouldable material to take impressions of your mouth. A dental technician makes exact plaster models of your upper and lower teeth and gums, which show how your teeth bite together. The teeth that will support the bridge are prepared to take the fixing and to make sure the bridge is not too bulky. At your final visit, the dentist will check that the bridges fits, make any minor adjustments and then fix if permanently in place. Your dentist or hygienist will show you the best way of keeping your new bridge clean. With a bridge, it is more important than ever to brush, floss and see your dentist regularly. If you do not control the build up of food debris and plaque the sticky film of bacteria formed from food acids your teeth and gums can become infected, requiring further treatment and resulting in possible loss of the bridge. Your dentist may also recommend using floss threaders that help remove bacteria from hard to reach spaces between the bridge and adjacent teeth and gums. If you maintain a good oral hygiene, you can expect your fixed bridge to last as many as 8-10 years or even longer. Natural teeth are protected from wear and tear and from moving or tilting out of line, which could cause your teeth to bite together incorrectly.